Why do most of us weight train? We want to look and feel good! We want our physiques to stand out above the rest. A slim waistline and wide shoulder structure with well-developed deltoids are essential if you are trying to achieve the highly desirable V-Taper physique. David Robson owner of Elite Physique Training Studio, describes it well: ” V-Taper, the perfect melding of broad shoulders, small waist and flaring lat muscles, a look synonymous with perfect symmetry and proportion.” Veterans of weight training like Mr Scwarzenegger come to mind when the term V- taper is mentioned. You could say V taper is somewhat old school, many guys are now training for outright size, jeopardizing their taper physique, I’ve seen countless guys in the gym with huge shoulders and chest ruining their physiques with bulging waistlines it’s certainly not aesthetically pleasing, sadly it’s starting to become quite a norm. When you think about it, the deltoids are such a high vis muscle group, they can be seen from every angle, making them a very important muscle to train whether you are training for V-Taper or not. It becomes especially important if you are hoping to enter any competition that you train all three heads of the deltoids, don’t forget the rear delts, I’ve been guilty of this many a time over the years. The Deltoid muscles are made up of the front, side and rear heads. If you want a total shoulder workout, you must do specific training for all heads. Anterior deltoids (Front) Seated dumbbell press. Lateral deltoids (Side) Standing side lateral raises. Posterior deltoids (back) Bent over lateral raises. Bench – a sturdy well made bench will pay dividends in the future, cheap ones break, they rock around and you end up buying a better one or worse doing yourself an injury, learn from my mistakes! Music – I have to have some tunes playing loud, for some reason I seem to train harder with a few of my fav tracks blaring out. To start this shoulder workout we will start with a pressing movement, great for gaining mass and strength. Next, we work the side of the deltoids…The lateral deltoid also is known as middle delts, outer delts, or side delts, but not the medial as it is sometimes mistakenly called. Standing dumbbell side lateral raises are probably one of the most important isolation exercises a bodybuilder will have to do, why? It’s one of the few exercises that works the side head of the deltoid. If you develop your side deltoids your waist will start to appear small as your shoulders broaden the all-important v shape. Overhead presses will not work all of the deltoids, many bodybuilders feel the side delts get left behind if you concentrate solely on shoulder presses, lateral raises will help even things out. Secondary Muscles used: Anterior deltoids and trapezius, upper and lower. Grab a pair of dumbbells palms facing forward and press dumbbells together 4 inches in front of your hips. Slowly raise the dumbells in an arc until your arms are parallel to the floor. Slowly lower your arms back down, you will feel it a lot more if you keep it slow! The final exercise in our dumbbell workout, the Standing Dumbbell Bent Lateral Raises, another isolation exercise that is crucial for developing the posterior deltoids, the backside of the shoulder. Will improve strength shoulder health and posture. Stand up straight whilst holding a dumbbell in each hand, feet should be shoulder width apart. Make sure you keep your back straight, lean forward until your back is parallel to the floor and your arms are hanging down in an extended position. Keeping the slightly bent position of your elbows throughout, raise the dumbells until your arms are parallel to the floor. Slowly lower dumbbells back to starting position after flexing rear deltoids at the top of the movement. A fairly quick deltoid workout, train with intensity, 1 minute rests between sets and your delts will be burning after this workout. Can always work your traps after! Don’t forget to do a general warm up before you begin the workout, dynamic stretches or a short run, bike or row will be enough. NextPork For Protein – Take A Break From Chicken! I have a friend who goes to the gym a lot. He told me that nowadays nobody trains properly at the gym. Most guys seems to enjoy being impressive by simply training their chest and arms. 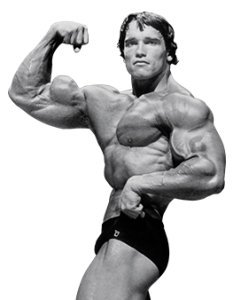 Schwarzenegger did a very good job creating the competition requirement of the V-shape. Your workout seems pretty cool. Now I just need too get some dumbbells so that I can work it the three parts of my deltoid shoulder muscles. Before I can purchase those dumb bells I will just use a couple of old textbooks for now. Do you think that would work? Hi Win, try and get hold of a couple of bricks they can be used as a substitute for dumbbbells! I wouldn’t recommend using for long but you can practice form etc, or you could try a few bodyweight exercises. Handstand push-ups, pike push-ups, push back push-ups, all work the deltoids. Hope that helps buddy. This is really cool. I made it a goal of mine this new years to really hit them weight room hard and put on some new muscle. But like most things worth having, that is easier said then done. It’s just that there are so many machines and exercises that work different muscle groups, it can get a little confusing to which one I need to use. So I am glad I came across this article, exactly what I needed for my arms. great article, definitely taking these exercises with me to the gym next time I go. Always try and use the free weights if you can, you will add muscle mass quicker this way! Make sure you have at least six compound movements in your routine, bench press, squat, shoulder presses to name a few. If you are just starting out, don’t be afraid to ask others for advice. The big one to remember when you start back at the gym do not sacrifice form for weight, you will build muscle a lot quicker with a lower weight and correct form, this also will reduce the risk of injury. Absolutely love the site! I will most certainly be taking advantage of all the workout and diet tips! Thanks! Thanks for the kind words Mike, I’m glad you like the site!